When your application demands a unique set of physical attributes, Everett Charles Technologies’ team is ready to provide a custom solution. ECT has been providing custom spring probes for over 50 years. By leveraging this vast experience ECT can effectively work with you to understand your requirements and translate them into a targeted solution. Each application demands specific spring probe attributes. Mechanical parameters such as overall length, spring force, pitch and compliance define the physical envelope. Electrical parameters such as current and resistance help define material selection and plating. High current applications demand low and consistent contact resistance. Probes introduced into rugged environments must withstand shock and vibration. High speed communication and wireless applications require reliable and accurate RF signal integrity. Automotive markets demand ever increasing temperature extremes. Time-to-market is essential for a successful product launch. The need for rapid prototyping has become a standard customer request. Using its industry leading portfolio of contacts and in-house manufacturing capability, ECT is adept at quickly providing prototype spring probes. Getting the design correct on the 1st pass is key to staying on schedule. ECT capabilities include generating electrical RF simulation files and mechanical CAD drawings to better ensure a working solution on the initial revision. 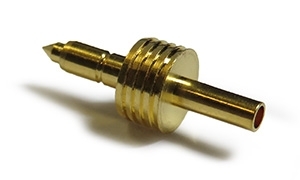 Custom probes from ECT can be designed for use with off-the-shelf or custom receptacles (replaceable contacts) or socket less (non-replaceable contacts). Receptacle options include wire wrap, crimp and solder cup.